This is my love story. It’s about love at first sight and crossing distances just to be with the person that makes your heart skip a beat. It’s about saying “I do” on the beach while the last rays of the summer sun illuminate eyes filled with tears of happiness. It didn’t … It got bigger or I got smaller, but anyways the wedding dress was beautiful! With my gorgeous bridesmaids… Love you, girls! Quite literally, our first date set the beginning of our life together. With no exaggeration needed, it lasted about 30 hours because we just couldn’t say goodbye. We wanted to continue learning more about each other, to feel more and to just be together in general. These mere hours felt like years had passed, as we shared our first kiss with the delightful surprise of expressing his love for me. In these 30 hours, he also decided that he would move to another country just to be with me. And that’s exactly what he did! How could you not love this kind of man?! He is my angel, whose name is actually Angel! After a month, we were already living together. Although things were happening fast, it naturally felt right. We built our home together from bare walls. It was a long and exhausting process, but it made us even closer. The end result was a beautiful young couple’s apartment full of love and dreams about their future together. The creation of our home is what sparked the birth of my first blog, Adorable Home; a virtual magazine that is all about interior design and decorating ideas intended to help others like us build their love nest. Our apartment became even more special to us, as it was the place that I heard the question I had been waiting to hear: “Will you marry me?” It was midnight on St. Valentine’s Day and even though he had plans for proposing the day after, he said he just couldn’t wait any more. After seeing my soft, gracious, sparkling diamond ring I was glad that he didn’t! It was a beautiful intimate moment, one that a girl will always remember. It was a moment that made me feel very loved and desired. Being a beach addict and living close to the beach for all my life made it a given that I would want a beach wedding. As this was non-negotiable, I’m very glad that he agreed! So we decided to get married on July 7th of this year (2014), as it would be hard to forget our anniversary. We had less than 5 months to plan the wedding, which really meant that I had less than 5 months to plan the wedding. We all know that men are not much into weddings as we are. But that is what makes us deliciously different and complimentary to each other! To make things even more interesting, I decided to plan the whole thing myself! As you’d probably be stunned by this bold and reckless decision, there are plenty of reasons why. By that time I already had a few years of experience in blogging under my belt. 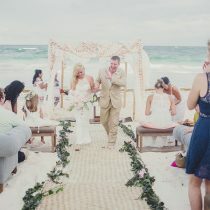 Right after I got the ring, I decided to start a blog on beach weddings, called Beach Wedding Tips. 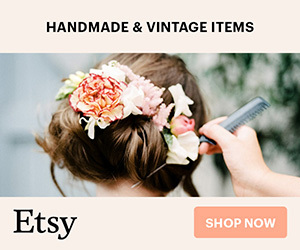 I started browsing thousands of wonderful wedding pictures, exploring reception décor ideas, hairstyles, wedding dresses and all the other wonderful details that come with wedding planning. I spent a month or two daydreaming until I knew exactly what I wanted: a ceremony on the beach with our closest relatives and friends, a beautiful sunset on the Black sea coast, white, turquoise and sand color palette, and starfish, burlap and baby’s breath decorations. It was going to be simple, stylish, and oh so beachy! Being self-confident by nature I knew for sure that I could pull this off on my own. I don’t regret it at all, but let’s say that I strongly recommend hiring a wedding planner. You’ll save yourself A LOT of trouble and your wedding dress might actually fit you on your wedding day! I have to admit though that I did eventually succumb to soliciting help from a local wedding agency called Pertito. 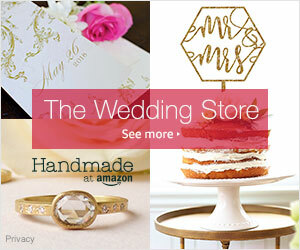 They gave me suggestions on wedding venues and found the perfect people to make my wedding truly special! This included my photographer, Krum Krumov, and his gorgeous wife Antoaneta who was our lovely hostess for all the festivities.They were the cutest couple ever! Thanks also to our DJ Kamen and video operator Niki. Now let’s get to the juicy wedding details! The best option that you can choose for your beach wedding is to have your ceremony and reception at one place, or at least nearby. 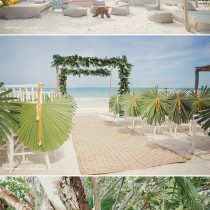 For my wedding, I chose Nomad Beach Bar in Albena Resort, close to Varna, Bulgaria. It’s an awesome place by the beach with an open air restaurant with a cute little beach bar! The ceremony was led on that beach in the middle of two abandoned bridges by sunset – the perfect setting. All the guests and my handsome husband-to-be were waiting for me at the aisle as my father and I walked on the wooden deck whose way was paved by our bridesmaids and groomsmen. It was the most emotional moment of all! I was shaking and hardly managed to stop my own tears. People were crying as I was walked pass them, continuing the emotional mood. Right after the ceremony, our guests were invited for a cocktail at the beach bar while we were having our photo shoot on the beach. The restaurant is right next to the beach bar, so switching places was absolutely no problem at all. I’d like to take a moment and thank the lovely Nomad’s manager Reni and her wonderful staff that took care of everything and made us feel very welcome! I really loved my dress! It was made for me by a local designer named Zornitsa Atelier. It had a lace corset and a tulle bottom, both in a champagne color, with a cute sandy sateen ribbon on the waist. The back was deep V-cut, which was perfect to show my kissed-by-the-sun skin. It really made me feel like a princess! I really wanted this day to be one of a kind experience; not only for me, but for my guests as well. So I decided to personalize everything I could. For this purpose, I got help from a local advertising agency called FIL. I sat with their lovely designer, Maria, and we came up with beautiful wedding invitations from recycled cardboard, printed white paper and sisal. Next, we did labels for wine and water bottles. This creative endeavor resulted in a simple design with white and turquoise colors, our names, wedding date and a starfish accent. I have to tell you that these labels were a hit! There were definitely a number of guests leaving the event with a few empty water bottles in hand. The shoe station sign, guest book and honeymoon fond box all had the same design as well. I saw a cute idea on Pinterest for a wedding favor and table card all in one. This was perfect for me! So I bought tiny glass bottles with corks, took sand from the beach, found small seashells in a local craft store, and just happened to have sisal left from the invitations. I called a few friends and in just a jiffy, the wedding favor factory was open. It even included a few bottles of wine to make things fun. I cut the cork in the middle, stuck the name card there and added little tags on the bottles that read, “Thank you for being with us”. But instead of writing 70 tags with my very bad handwriting, I ordered an ink stamp to save me the embarrassment. Smart, hah?! I bought linen table runners in a nice sand-like color and scattered seashells on them. I’m a huge fan of candles and lanterns, so I bought white metal mismatched lanterns and tea candles to set a romantic mood on the tables. As I’m not much into opulent centerpieces, I picked simple turquoise glass bottles, which were the perfect choice for my small baby’s breath bouquets. A little sisal with a starfish in the end brought the whole thing together perfectly! Even if the table number holders look pretty simple, they were very challenging to make! I wanted to keep things as natural as possible, so I chose wooden pictures frames to decorate with a turquoise ribbon, vintage lace and a starfish. So far so good, but then I ran into the dilemma of finding 10 identical wooden frames. Because of this, I had to wait 3 weeks and collect them from 4 different cities! As you can already imagine, time was precious and we didn’t have much to waste! To my relief, the crafty hands of the girls of Flora Décor helped to make sure that they ended up exactly as I wanted. After lighting up the spark of love, it was time to light up some sparklers too! Right after midnight we asked our guests to hit the beach once again and to line up so that we can walk through the tunnel of lights and get some of those stunning images that you see here. Everyone was very excited about the idea and as a result, it turned out great! Next in row were the sky lanterns. This is a must for every beach wedding, I can tell you that. It’s just amazing when you have the chance to engage all of your guests and offer them to do something they have never done before. As the night sky was brightened by the sky lanterns and everyone looked up in complete awe, I knew I nailed it! Here are a few of my wedding selections that made our special day even more enchanting. Throughout the night we listened to pop, disco, ballads and a lot of rock (I’m a rock girl in my heart). The party went on until 3am! There was a lot of dancing, laughter, games, speeches, embarrassing moments (of course) and a lot of happy faces. Exactly as I wanted! My wedding was my biggest challenge as a former event planner. Things get even more complicated when the participants are close to your heart, because you want to give them the best you possibly can. I really hope I managed to offer them a night of celebration that they’ll remember forever. On that day I felt nervous, exhausted and highly emotional, but most of all happy. Now when I look back, it almost feels like a dream. I’m sure that all people who have already tied the knot know what I mean. Thank God for the images! BTW, did I mention that my hubby and I have absolutely nothing in common? I guess opposites do attract! If you have any questions or comments, please share them below. I’d absolutely love to hear from you! First, let me tell how a beautiful bride you make! You look so gorgeous in these pics! I’m a portuguese bride-to-be, full of ideas and also with that firm decision of “my wedding will be on the beach, no matter what”. Fortunately my handsome groom has the same idea of the perfect marriage, so we are in the same page! 😀 The place I leave is usually sunny around this time of the year, but we have had some tricky surprises, so I’m just hoping everything will be fine in one year time! Yes, one year… I know you had much much less time, but I believe that sometimes it is better so! Hehehe. I just wanted to thank you for sharing such a beautiful moment on this website, congrats! Specially I loved the songs list (I’m still figuring out how to make the groom dance… =(! ). Congrats on your engagement! And thumbs up for your decision to get married on the beach – no better place for a wedding! I wish you both an amazing wedding and a very happy life together!